Radiography is the process of taking X-rays and interpreting the results. 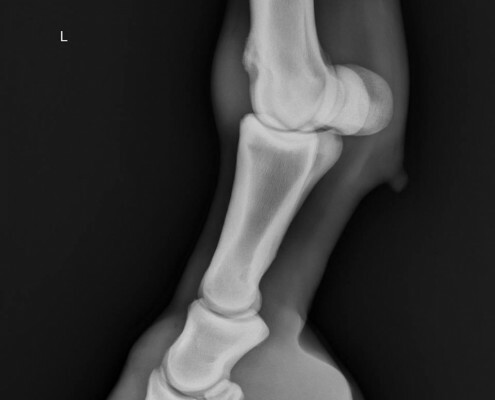 X-rays are a valuable asset and key tool in diagnosing a multitude of problems in horses. Digital radiography is the latest advancement in X-ray technology and has been in use at our practice for more than 12 months. With this technology we no longer require the slow and tedious traditional methods involving chemicals and film to develop an image. Digital equipment now allows us to process pictures immediately onto a laptop screen for instant interpretation on site. The images are stored on a database at the practice which enables further evaluation on a large high definition screen when necessary. 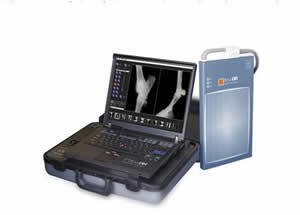 Digital radiography provides a vast improvement in image quality enabling the detection of even very subtle changes. Thus it is no longer necessary to wait for the vet to get back to the practice to develop the images for the results. This allows faster and more effective management of problems and therefore a more speedy recovery of the horse. Digital format has made it possible for us to email pictures for second opinions in an instant, again allowing for a far more superior service to our clients than before. If most of the above criteria cannot be met it is advisable to transport the horse to a suitable area that does meet the criteria. In the event of an emergency and inability to transport the horse special arrangements can be made.